Solar Katrina – Upcoming evolution of a strong flare! We have only heard about the ‘hurricane Katrina’ which had caused huge destruction in USA. This time, it is Solar Katrina which is making the headlines. Last week the Sun sent out the strongest flare in four years which caused some problems in radio communications and slight disruption of civil aviation. The earth is getting hotter year-by-year with an increase in the temperature levels. According to scientists, it is high time we think and act on the concept called “space weather”. The scientists warn that the earth has to be prepared for an intense electromagnetic storm which is termed as “Solar Katrina” which might cause a $2,000bn loss in the balance sheet of world economy. Solar Katrina is a solar storm which has been predicted by eminent space research scientists of the world. The issue is getting more momentum because of the vulnerability of the earth by the long spell running of the Sun from the 20th century. The US National Oceanic and Atmospheric Administration, warns the nations to get prepared for an intense electromagnetic storm that, in the worst case, could be a “global Katrina” costing the world economy $2,000bn. 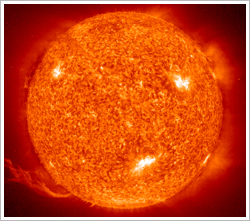 A solar storm is capable of erupting hot gas which travels from the Sun at a speed of 5m miles an hour. As a result of this, the atmosphere will be hit by electrically charged particles causing electromagnetic havoc. A more intense storm can cause a total shut down in communications satellites and may cause permanent damage to the equipments. This kind of extreme magnetic fluctuations can stimulate surges in power lines, to cause grid failures. The next solar maximum is expected in the year 2013. The scientists warn that we should prepare and also try to predict solar flares. Once the flare is spotted on the sun, it takes between 20 to 30 hours to arrive with devastating electro-magnetic storm. The most dreadful solar storm or Solar Katrina in the history is the one which occurred in 1859. It ruined a considerable portion of the world’s newly installed telegraph network. If electricity is a technology, then it is the only technology on which all the other technologies, services and infrastructure virtually depend. An interruption in the electricity will cause disruption in communication, banking and finance sector, transportation etc. And the situation will turn chaotic within no time. So, an 1859-kind of solar storm today could blow away the world’s communications, information and electricity distribution systems; and it is likely to cost an estimated $2,000bn to the world economy. The terrestrial vulnerability of the earth is at the peak level, because of the Global Positioning Satellites (GPS). We have reached that stage where we highly depend on GPS not only for navigation, but also for mobile phone network co-ordination. The good news is that if the solar Katrina does occur, at least it will have between one and four days of notice. NASA has put in place a defence called ‘solar shield’ consisting of satellites that can spot solar storms destined for earth. Although it identifies those days in advance, the crucial moment comes about 30 minutes before impact when the storm sweeps past ACE, a spacecraft stationed roughly a million miles from earth. The craft measures the storm’s speed, density and magnetic field and transmits the data to Earth where scientists say, they can work out where the damage will be greatest, allowing them to warn public utilities. It seems that fear of cosmic rays, comic though it may sound, has become another legitimate reason to go off grid!